Property developer IGB Corp Bhd is planning the last phase of development at Mid Valley City (MVC), which will feature two high-rise office towers worth an estimated RM1 billion. 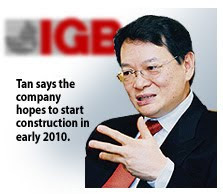 Group managing director Robert Tan Chung Meng said IGB is awaiting approvals from the authorities and hopes to start construction in early 2010. The two towers, which will be built similar to the existing 35-storey The Gardens North and South Office Towers, will offer 600,000 net sq ft of commercial space, Tan said. They will be built on a 0.8ha site, which was originally meant for a convention centre, and later two blocks of high-end condominiums. "We were toying with the idea to build condominiums or office towers. There are some residential developments coming up opposite MVC and we don't intend to compete with them," Tan said. "MVC has become very much a commercial and retail hub so we decided to go with the office towers to take advantage of the development's MSC status, and to cater for rising demand," he added. Tan was speaking to Business Times in Kuala Lumpur at the launch of Mid Valley City MSC Malaysia Cyber Centre One Stop Centre recently. The centre was launched by Multimedia Development Corp chief executive officer Datuk Badlisham Ghazali. Mid Valley City Sdn Bhd executive director Anthony P. Barragry also attended the event. MVC received MSC Malaysia Cybercentre status on September 11 2008 under the MSC Malaysia National Roll-Out plan. IGB pumped RM15 million into MVC, to enable fibre-optic connectivity through-out the mixed-development hub. Barragry, meanwhile, said IGB will apply for MSC status for the two new office towers and it expects the take up for the properties to be as good as The Gardens North and South Towers. According to Barragry, the North and South Towers are currently 95 per cent and 65 per cent leased, respectively. Revenue from office rentals, which stood at RM55 million last year, is also expected to rise this year. He added that MVC would make up more than 41 per cent of IGB group revenue for the year ending December 31 2009. TA GLOBAL Bhd is teaming up with Townline Gardens Inc, a Canadian home builder, to develop a C$130 million (RM422.5 million) mixed-development project over seven years. A joint-venture agreement between TA Development One (Canada) Ltd, a 100 per cent unit of TA Global, and Townline Gardens Inc was signed yesterday. Under the agreement, TA will hold a 65 per cent of the joint-venture, in which TA Global will pump in C$11.7 million (RM38.03 million) as equity contribution. "The joint venture will complement TA Global's corporate strategy to expand its property development activities into British Columbia, Canada... In addition, it is expected to increase the revenue stream and return of TA Global Group," said the company. The residential and commercial units will be built on a 8.9ha land in the City of Richmond, British Columbia, in a project known as "The Gardens". It consists of about 470 apartments and 70,000 sq ft of retail and office space. More than half of the site is agricultural land, which will be developed as a public botanical park and urban gardens. The project will be developed in six phases over a seven-year period, from 2010 to 2017. The cost of construction will be funded via internally generated funds, external borrowings or a mixture of both. TA Global is the property division of the TA Group with its primary businesses of hotel operations, property management, investment and development. PROPERTY trust Amanah Harta Tanah PNB 2 has agreed to sell an office building on Jalan Tuanku Abdul Rahman in Kuala Lumpur to Madras Jeweller Sdn Bhd for RM15 million. The sale was being done as part of the unitholders’ resolution to terminate the property trust. Proceeds will be returned to unitholders, AHP2 said in a statement to Bursa Malaysia. AHP2 bought the 9½-storey office building 14 years ago for RM11.5 million. PETALING JAYA: Visitors to The Star Pro perty Fair can check out the latest offerings from local developers at the event which begins today at 11am at the Kuala Lumpur Convention Centre. The fair, which will be held at Exhibition Halls 4 and 5, will end on Sunday at 7pm. Admission is free. A variety of properties including medium and high-range houses, bungalows, exclusive condominiums and other commercial projects from participating developers will be offered. Those who have made purchases will also be pleased to know that there will be financial services at their disposal such as on-the-spot advice and easy financing plans. Talks and forums will also be conducted by industry experts on topics ranging from property investment and wealth management to interior decoration and feng shui. Other attractions include the CIMB Property Mart Mega Auction, to be held tomorrow afternoon at 12pm and 3pm. The public auctions will be auctioning off apartment units, houses and a plot of bungalow land. Visitors can also take part in a contest offering attractive daily prizes. Prizes will be drawn daily and all winners will be listed on www.starproperty.my. For details, call 03-7967-1388, ext 1456/1165.